Ten years ago the Skegness Standard reported the Clock Tower was beyond repair and was going to be moved to a London Museum. On April 1, 2009, it was stated the decision had been made because the focal point of the town had taken a battering over the years from biting sea winds and the original brickwork was beyond repair. The report said: "But what is most worrying is the damage caused by last year's earthquake which shifted the tower, making it lean. Conservationists believe it has ruined the foundations so seriously, it could fall down. 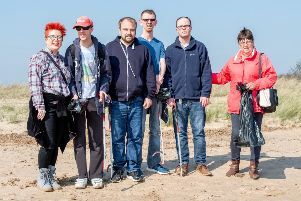 Coun John Byford, of Skegness and District Civic Society, said: "The lean is becoming really pronounced. "It had started to lean gradually over time, but I think the earthquake had a massive affect on it as it seems to get worse week by week. "It's a huge blow to Skegness to lose its icon, but the alternative would be losing the Clock Tower altogether, which would be a tragic loss to the history of Skegness. "At least this way, it has a chance of survival." Experts from the National Maritime Museum in London came to assess the tower, which was built in 1898, and offered to take it down brick by brick and re-build it within the museum. Coun Byford said: "They said the damage is so great it could last five years at the most before it topples over. "We can't risk it. With the stress of events like the illuminations switch-on and New Year's Eve, which centre around the Clock Tower, I fear it won't last beyond two years." Once the necessary permissions have been granted, it is hoped the demolition of the Clock Tower will begin in September so it can enjoy one last season at the heart of Skegness." Residents were asked what they would like to see replace the Clock Tower and the article received a huge response - until they realised the date and that it was a April Fool's joke. Coun Byford recalls: "East Lindsey got a few angry phone calls." Have you been caught out today? Tell us your stories.